Autumn Gardens is a small professional team, used to working closely with our clients in a flexible and friendly way to design and install feature driveways. We work within industry standard guidelines to prepare the site and use recommended materials for both the sub-base and the driveway surface. A new paved driveway or pathway will give real presence to your property, while adding more than the cost of your investment to the value of your home. Choose from a large selection of paving materials and colours, including circle sets, to create a feature design for your driveway. Block paving is a proven durable and hardwearing material that is attractive and easy to maintain. Autumn Gardens can advise you on the new legislation and the different options available to install your planned block paved driveway or additional parking space with out planning permission. The traditional method for installing block paving can still be used by installing a drainage system, within the boundary of the property to allow the surface water from the paved area to be drained. A new permeable method of installing block paving has been developed to allow the rainwater to drain, through the paving and into the ground in a natural way, this will depend on the kind of subsoil in your area. 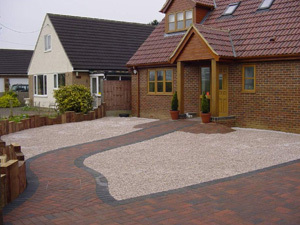 This is a popular option where large areas of driveway are required. With a wide selection of decorative gravels and chippings in a variety of colours now available, an attractive entrance to your property can be installed. 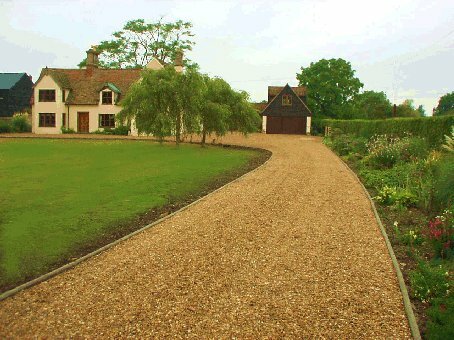 A gravel driveway installed using the right materials to form a solid base will last for many years. It also allows flexibility in the design to create sweeping lines and curves, highlighted with decorative edgings. Autumn Gardens has a depth of experience in the installation of driveways, working with you to develop plans for your driveway, advising on types and styles of edgings and gravel or chippings that are available. Additional parking is high on the list of customer requests, usually extending the driveway, by replacing the front lawn or garden areas to give extra parking for the family. 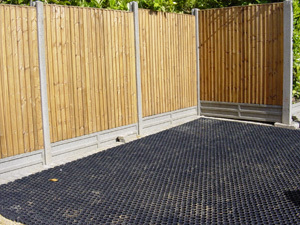 Laying a permeable grid structure made from recycled strong plastic or Marshalls grassguard system, gives an alternative option for installing additional parking spaces. The sub base for the parking area is installed to the same standard as a block paved driveway, the grid system can then be filled with gravel or with soil and sown with grass seed, giving the benefits of a driveway for parking, but retaining the look of a garden. Follows the exact process for laying a block paved driveway using a firm permeable support layer, except the 50mm deep plastic honeycomb structure is laid on a compacted base of sand, soil and humus. Small stone chippings/gravel is used to cover the bottom of the honeycomb, before filling them with a mixture of sand and soil. Grass seed is then sowed on the top of the honeycomb.